Showplace Wood Cabinetry in Light Griege Brushed Vintage matte finish. Luxury vinyl tile floor with shower floor in ceramic tile. Shower walls and custom bench in The Onyx Collection. Vanity top in Cambria quartz, Torquay. Closet organization by Easy Track. 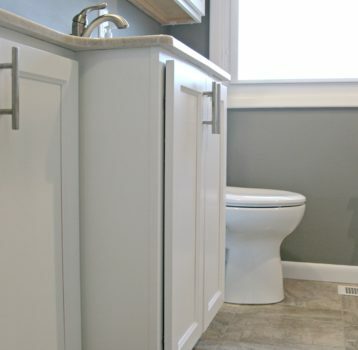 From the very beginning, the goal and purpose of this master bathroom remodel was to improve functionality, specifically for future days when wheelchair access may become necessary on a regular basis. But did the homeowners want to approach this without any concern for the aesthetics in mind...absolutely not! We think the end results are proof that the words handicap accessible, functional and beautiful can all adequately describe the same space. Each area of this bathroom now works for him and her both. 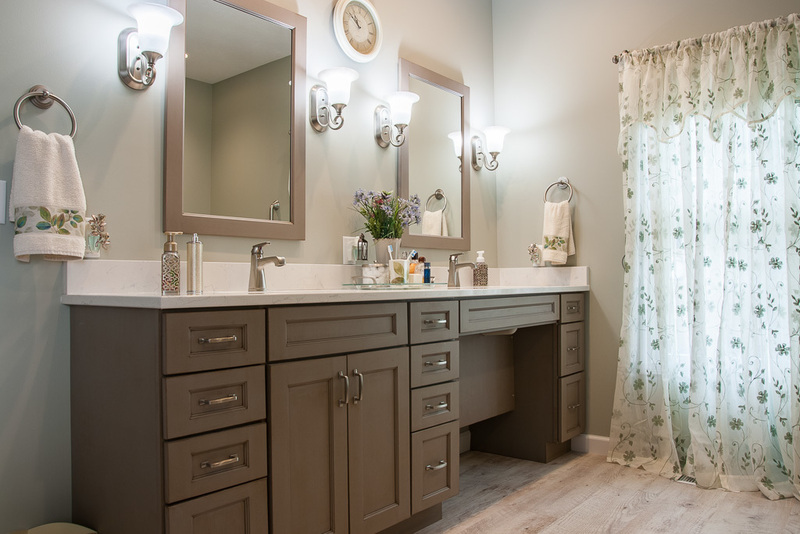 The double bowl vanity with roll under access at one end means he can be at the sink with ease, and she doesn't sacrifice any valuable storage space. Zero barrier entry to shower with custom bench is really the spa look we are all looking for - large shower space with a seating option and hand held spray. The bathroom is large enough for a soaking tub and the minimal decking allows for easier maneuvering in and out. All water controls are at accessible height and location, as are the grab bars for optimal safety. 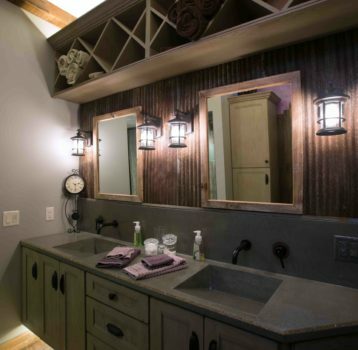 To eliminate what you could call "door congestion", both the closet door and entry door to the bathroom are replaced with barn style sliding doors. Add some new closet organization and the homeowners are "beyond words happy with our bathroom remodel". It was truly our pleasure to help bring this project to life for this Veteran and his wife. Mixed Materials – Stunning by Design!